It's been a week since the Easter Bunny (i.e. me and the Daddy) took a stand on the Boys behaviour and withheld most of the Easter Eggs and such. A week where their behaviour has been hugely improved! I'm not saying they have been angels. But they have at least stopped being little demons! And that was all we were asking for! So this morning they came trotting downstairs to find the rest of their Easter Eggs waiting for them. Oh the joy on their little faces! 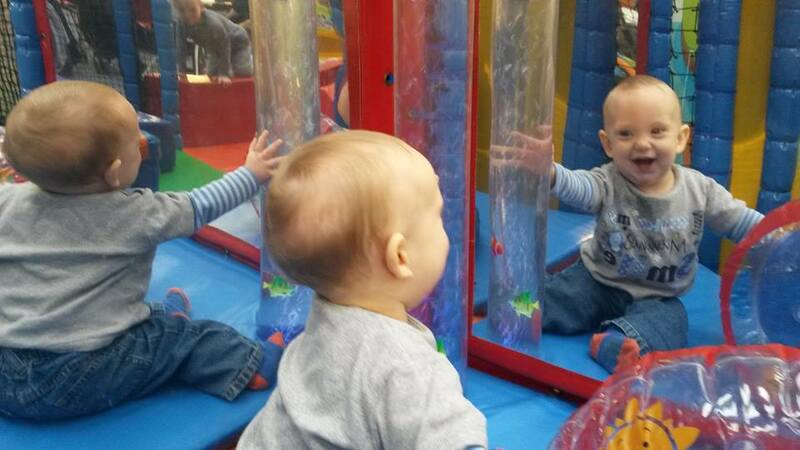 And today we went out on George's choice of a day trip - a session at Giggles soft play. Daddy came too. Even though he hates play areas. They have free wifi.... he took his Kindle! Easily pacified Husband. The masses of kids playing turns into white noise when you have Minecraft to play. Although Jack thought it was quite unfair that I wouldn't let him bring his Kindle too. We hardly saw the bigger three lads while we were there. Zip... Zoom... Whoosh... They were off and playing, burning off some of that chocolate! I took Freddie into the baby area and let him have a play with the mirrors and the bubble lamp with fish in. He loves them! But he loves to snuggle more in the afternoons so after a good play he wanted to cozy up with Mummy and nibble on some snacks instead.